278 pages | 16 B/W Illus. 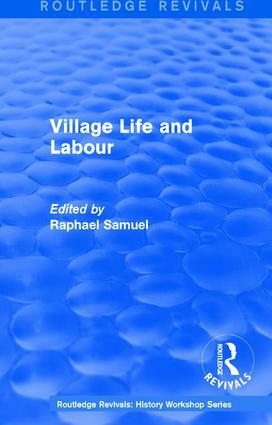 First published in 1975, this volume aims to direct attention at a number of aspects of the lives and occupations of village labourers in the nineteenth-century that have been little examined by historians outside of agriculture. Some of the factors examined include the labourer’s gender, whether they lived in ‘closed’ or ‘open’ villages and what they worked at during the different seasons of the year. The author examines a range of occupations that have previously been ignored as too local to show up in national statistics or too short-lived to rank as occupations at all as well as sources of ‘secondary’ income. The analysis of all of these factors in related to the seasonal cycle of field labour and harvests. The central focus is on the cottage economy and the manifold contrivances by which labouring families attempted to keep themselves afloat. First published between 1975 and 1991, this set reissues 13 volumes that originally appeared as part of the History Workshop Series. This series of books, which grew out of the journal of the same name, advocated ‘history from below’ and examined numerous, often social, issues from the perspectives of ordinary people. In the words of founder Raphael Samuel, the aim was to turn historical research and writing into ‘a collaborative enterprise’, via public gatherings outside of a traditional academic setting, that could be used to support activism and social justice as well as informing politics. Some of the topics examined in the set include: mineral workers, rural radicalism, and the lives and occupations of villagers in the nineteenth century; working class association; the development of left-wing workers theatre and the changing attitudes to mass culture across the twentieth century; the changing fortunes of the East End at the turn of the century; the position of women from the nineteenth century to the present; the miners’ strike of 1984-5; the social and political images of late-twentieth century London; and a three volume analysis of the myriad facets of English patriotism. This set will be of interest to students of history, sociology, gender and politics.